War and landscape, one of the oldest themes. ayr converses hustings focused on arts & cultural regeneration in Ayr in the 2012 local council elections. ayr converses hosts an arts & cultural regeneration in Ayr focused hustings for the three Ayr ward candidates in the 2012 local council elections. Download flyer: ayr converses a5_final please distribute. 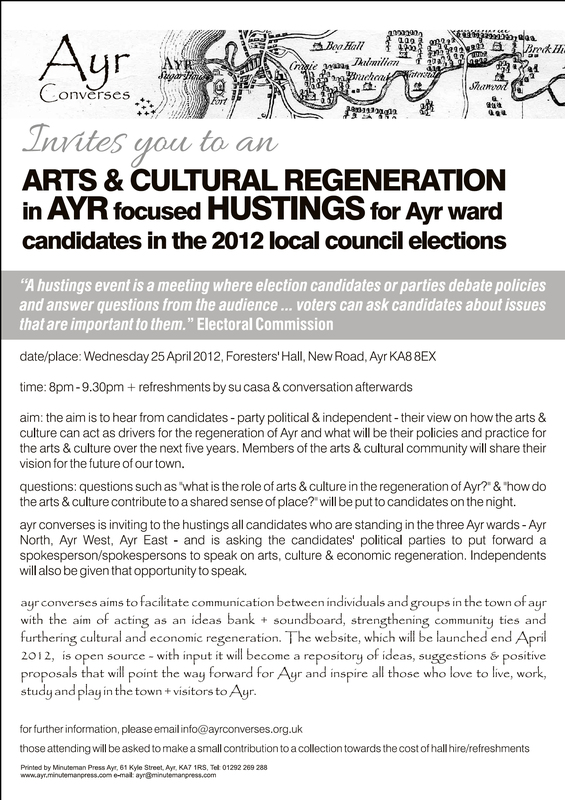 ayr converses is hosting an arts & cultural regeneration in Ayr focused hustings on Wednesday 25 April 2012 at the Foresters’ Hall, New Road, Ayr KA8 8EX. The hustings is from 8pm – 9.30pm. All those who wish to see South Ayrshire Council place greater focus on the arts and culture in the regeneration of our town are welcome to attend. The aim is to hear from candidates – party political & independent – on how the arts & culture – including the creative industries – can act as drivers for the regeneration of Ayr and what will be their policies and practice for the arts & culture over the next five years. Each candidate who wishes to speak will be given a set time in which to speak. Members of the arts & cultural community including Chris Taylor of Hipshot Theatre, Laurin Campbell, the new YDance freelancer in South Ayrshire & Chris Fremantle of Ayr Gaiety Partnership & Public Art Scotland will be given the same set time in which to share their vision for the future of our town. The hustings will be chaired by Karen Murray of Newton & Heathfield Community Association. ayr converses has invited all candidates who are standing in the three Ayr wards – Ayr North, Ayr West, Ayr East – and has copied the invitation to all candidates standing in the other five South Ayrshire Council wards. Parties have been asked to put forward a spokesperson to speak on arts, culture & economic regeneration. The same opportunity has been extended to independents. A good number of candidates have confirmed that they will attend and participate with all parties represented. Independent candidates have also confirmed that they will participate. There will be refreshments by su casa after the hustings to give those participating time to meet & converse in a sociable setting. Those attending will be asked to make a small contribution to a collection towards the cost of hall hire & refreshments. ayr converses aims to facilitate communication between individuals and groups in the town of ayr with the aim of acting as an ideas bank + soundboard, strengthening community ties and furthering cultural and economic regeneration. The website, which will be launched end April 2012, is open source – with input it will become a repository of ideas, suggestions & positive proposals that will point the way forward for Ayr and inspire all those who love to live, work, study and play in the town + visitors to Ayr. 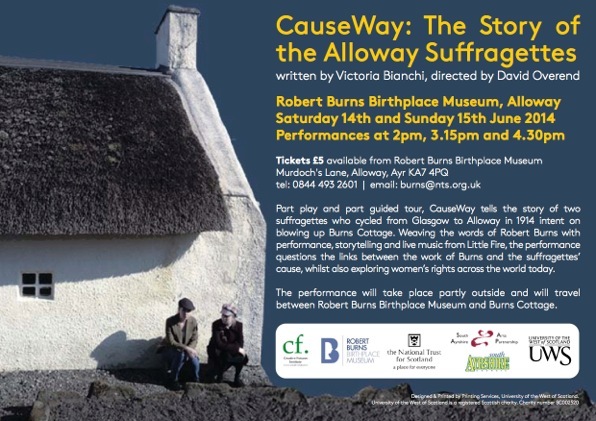 This event organised by the Scottish Artists Union took place at the Lighthouse in Glasgow. Some information can be found here. “You see in this country for instance (Britain) writers are not involved in the sort of things I’m doing, because it’s a much more settled society, writers write to entertain, they raise questions of individual existence, the angst of the individual. But for a Nigerian writer in my position you can’t go into that. Literature has to be combative, you cannot have art for art’s sake. The art must do something to transform the lives of a community, of a nation, and for that reason you see literature has a different purpose altogether in that sort of society – completely different from here…. And a writer doesn’t earn money in Nigeria, because although you have a 100 million people, most of them cannot read and write there, so literature has a different purpose. So here I am, I’ve written 22 books, I’ve produced 150 episodes of a T.V. programme which everybody enjoys, but I’m poor! This event was focused on the Scottish Government’s draft National Cultural Strategy. This is an open invitation for you to join us for an unique opportunity to hear Rhona Brankin MSP, Deputy Minister for Culture and Sport, speak about the new National Cultural Strategy. The meeting is being held at Lumsden Village Hall at 7pm on Monday 2 October 2000. The meeting is open to everyone interested in culture in the North East of Scotland and there will be an opportunity to ask questions and raise issues with the Deputy Minister. The National Cultural Strategy recognises that our culture is not only the arts, but is also the buildings and landscape of Scotland, the language and traditions, and that culture permeates every aspect of our lives. A strong and vibrant culture can have enormous social and economic benefits. The Scottish Sculpture Workshop initiated the programme of discussions on ‘Culture and the new Scottish Parliament’ because one of the strengths of our culture is discussion and debate. This is an opportunity to speak directly to the key politician with the responsibility for government policy on culture. The National Cultural Strategy is available from the Scottish Executive on 0131 244 0340 or on their web site at http://www.scotland.gov.uk/nationalculturalstrategy/. The Scottish Sculpture Workshop is an artists’ residency centre specialising in sculpture and known internationally. We provide a resource for artists including residential accommodation, facilities, and technical help. We initiate projects involving artists and facilitate the commissioning of public art in the North East of Scotland. The meeting will take place in Lumsden Village Hall which has recently been upgraded with an award from the National Lottery Halls from the Millennium Scheme. I very much hope that you will be able to join us for what promises to be an interesting and informative evening where you can hear about the National Cultural Strategy and raise issues concerning culture with Rhona Brankin MSP, Deputy Minister for Culture and Sport. In 1999 we followed this up with another meeting, on this occasion prior to the elections for the new Scottish Parliament. This meeting took the form of a ‘cultural hustings’. The candidates for the four parties standing in our constituency we all invited to answer questions from an audience. Again a note of the meeting was prepared and circulated, and on this occasion was also published in Artists Newsletter. The meeting at 7 pm on 2 October 2000 will therefore be the third meeting in the programme. We would like to thank Gavin Renwick for stimulating the idea to hold these meetings and Eric Robinson for chairing them. Lumsden Village Hall has provided an excellent venue for these meetings. This note was originally published on the Scottish Sculpture Workshop website. This event took place at the point where the first candidates for the new Scottish Parliament were standing, and it was more or less a hustings. Culture and the New Scottish Parliament. Report by Dr Anne Douglas, Senior Research Fellow in Fine Art, Gray’s School of Art. With the imminent election of members to the new Scottish Parliament, the second meeting in the series Culture and the New Scottish Parliament took place at Lumsden Village Hall on Friday 23 rd May. The panel consisted of three prospective candidates from Gordon district; Maureen Watts, representing the Scottish National Party, Gordon Guthrie, representing the Labour Party and Mike Rumbles for Liberal Democrats. The fourth invited member, ? of the Conservative party was unable to attend. The meeting was, like its predecessor, an initiative undertaken by Chris Fremantle on behalf of the Scottish Sculpture Workshop at Lumsden. Building on the success of the July meeting, the aim was to question candidates specifically on their parties’ plans for the provision for culture within the new Scottish Parliament. The candidates had received three prepared questions drawn up by representative members of the community within Gordon district as a means of focusing the debate. In the chair for the second time was Eric Robinson, who is currently involved in the promotion of culture within the voluntary sector. The meeting drew a significant cross section of people from Gordon District, some professionally involved in the development of the Arts through practice, education and administration as well as other participants engaged on a voluntary basis. The ensuing discussion debated a range of issues on culture, creating a matrix of links between, for example, access to culture and education; support for national institutions (such as the Scottish National Ballet) and provision at a local level; the choice between supporting professional and/or amateur activities, between so called ‘high art’ and/or popular culture, between heritage and/or contemporary culture. Deep concern was expressed on the depletion of resources, in particular within education, with the cut of visiting specialists to primary and secondary schools, and its negative effect on future participation and awareness of the Arts. The importance of local indigenous culture was stressed, specifically in creating and nurturing a meaningful Scottish identity, as opposed to a contrived ‘Tartan culture’. The nurturing of Doric culture was linked closely with the issues of engaging participation across age and specialism, through education. as well as dedicated festivals such as the anual Doric Festival in the district of Gordon. All three parties acknowledged the importance of decision making at a local level. Mike Rumbles (Lib Dem) cited with regret the retention of the control of broadcasting at Westminster and the opportunity that local control of the media offered, in promoting local culture. All three candidates saw the opportunity that the New Scottish Parliament created for reviewing the procedures by which funding and cultural resources are distributed. Where, at present, decisions rest with the Secretary for State for Scotland, it should now become possible to influence the political situation on an area basis. The possibility for extending a practice of positive discrimination presently ongoing in the Highlands and Islands, to other less privileged and geographically dispersed areas of Scotland was largely supported with a view to enabling, among other developments, a more appropriate fit between Lottery funding and local Arts plans. Gordon Guthrie for Labour responded on a number of occasions with the clear view that both the production and consumption of culture was a question of debate open to Scotland’s citizens. While Labour were committing £60 million to support the Arts over three years, there was an issue as to how this should be divided up. He compared Scotland to Iceland, where the development of culture, in particular popular culture, was instrumental in developing self confidence as a nation. This situaton was helped by the lack of segregation between culture, politics and business. He proposed that the professionalisation of politics in Britain with its current centres of expertise in academic institutions and trade union offices, resulted in distancing politics and business from culture. The discussion was drawn to a close, perhaps fittingly, by a question about the Per Cent for Art Scheme for the Visual Arts. The panel and members of the audience alike were informed of the current position by professional experts; the sculptor, John Maine and Chris Fremantle himself , both currently collaborating on a Per Cent for Art Scheme in the area at Kemnay, Aberdeenshire. Their role and recent experiences demonstrated quite poignantly the way in which meetings of this type and quality can function. At one level they create an opportunity to exchange important experience. At another, they form a mechanism for engaging a community in first raising the crucial issues impinging on current practice, and from these , in developing informed strategies in the company of political representatives. Dr Anne Douglas, Senior Research Fellow, Centre for Research in Fine Art, Grays School of Art. This report was originally published in Artists Newsletter and on the Scottish Sculpture Workshop website. This event was held following the referendum on devolution which had taken place the previous September, but prior to the establishment of the new Scottish Parliament. It was inspired by Gavin Renwick and Wendy Gunn’s project Whaur Extremes Meet and the evident need for a space for discussion about cuture and politics particularly in the context of significant change. Attendance: Robert Smith MP, Cllr. Rhona Kemp (Chair COSLA Language and Culture Ctte. ), Cllr. Jock McGregor, Cllr. Stanley Tennant, Cllr. Mitchell Burnett, Cllr. Kenneth Benzie, Jim MacDonald (Chair Gordon Forum for the Arts), Sandy Stronach (Chair Doric Festival), Alison Simpson (Banff and Buchan Arts Forum), Roxanne Permar, Suzannah Silver, Sarah MacKenzie Smith (all Grays School of Art), David MacLean (Scott Sutherland School of Architecture), Mary Anne Alburger (Elphinstone Institute, University of Aberdeen), Ian MacKenzie Smith (SSW Board and Museums & Galleries Commission), Jonathan Young (Head of Service, Planning), Ron Reid (Leisure and Recreation), Barbara MacLeod (Senior Arts Development Officer), Sheila Waterhouse (Arts Development), Fiona Bushe (Visiting Specialist), Frank Bruce, Jonathan Claxton, Chris Bailey, Frederick Bushe, Keiji Nagahiro, Gavin Renwick (all artists), Phil Sands (Mobil North Sea Ltd.), Mavis Wainman, William and Edith Petrie, Gordon Gillies, Kenneth MacLean. The Scottish Arts Council Initial Submission on Culture and the New Scottish Parliament to the Constitutional Working Party was circulated at the meeting. Eric Robinson opened the discussion by highlighting four issues for culture and the new Scottish Parliament – structure, policy, regional needs, and rural issues. It was agreed that critical points should be highlighted from the meeting, rather than a verbatim report. For the purposes of this report culture is used to include art, music, drama, poetry, language, etc. There is increasing pressure to deliver a widening range of subjects, and focus on the core curriculum. The result is that cultural and art teaching is being marginalised. This must be remedied, with culture becoming a fundamental component of the curriculum involved in every subject. If Scotland is to have a unique identity, this must be part of the educational system. Language is critical in the support of culture and all children should have the right to be taught in their mother tongue. The strength of Gaelic culture is a result of the promotion of the language. This is a model for Doric. At present the strength of Gaelic culture has created a focus for tourism in the Highlands, brought £9 million into broadcasting as a direct support for the language, and created a strong cultural identity. The involvement of youth in culture is vital. Sport presents a model for youth involvement. Sport is seen as an everyday part of life, not the domain of the adult, or of the school. ‘Education for leisure’ is a necessity in the light of the evolving nature of employment. IT, which is currently prioritised, should be integrated into other disciplines. Alford Academy published the definitive CD-ROM on the Scottish Colourists – this is an excellent example of integration. Visiting Specialists should be a statutory provision. Without culture teaching in Primary Schools children are disadvantaged in pursuing cultural subjects. The Review of Scottish Culture report to SCCC was brought to the attention of the meeting. This report highlights many of these issues. This is clearly an area that requires further discussion. The new Scottish Parliament should be transparent, its agencies should be transparent, and there should be ‘multiple lines of communication’ on cultural issues. The parliament should have a Select Committee on Culture. It was highlighted that the nature of the electoral process will create regional groupings of MSP’s. This should enable regional identity and culture to have a line of communication. Regional and local arts forums, Local Authorities, and individuals should all be contributing to culture in the new Scottish Parliament. The national cultural agency should be transparent and dspersed. It was noted that SAC did not reflect on itself directly in its submission. The tax system provides an opportunity for supporting the arts. There needs to be a balance created where the many Scottish cultures are promoted, and culture in Scotland is promoted. Scotland needs to develop culture in relation to Europe and look to models in other small European countries and regions. Beyond this Scotland needs to develop its culture on in an international context. Broadcasting and International Cultural Affairs should not remain a Westminster responsibility. This is clearly an area which requires further discussion.